I'm still slightly ambivalent on it - I miss the individual outs of the old CLK modules to some extent, though each approach has advantages. It certainly can provide a lot of interesting and playable rhythm - and even covers the audio range too nicely, so you could use it for sub-harmony generation. ii) right-hand divider is more binary /2 & /3 then each of these divided down by two - so these are equal spacing high and low. As with the DDSR, I'm not going to overly push it out at this stage, but a few can go out into the world. And I'll continue to play around with core divisionary ideas. Looks like such a fun playable module with the knobs and switches! You could provide for bringing individual outs to a separate expansion panel, either as a product for you or left to DIY. After all the stress at work this morning this is a lovely sight! How's the quad clk source to go it with coming alone? With this and the DSSR I'll be in desperate need for something to drive them. Ah, not possible - well, at least for the /2-to-/9 part - those divisions would have to be done with several of the chips. How's the quad clk source to go it with coming along? Quad?! It was a dual, but I was feeling to take it down to a single in 2FW. You can currently use anything oscillating such as VCO or looping-env -- but I do want a specifically tuned Clock module SOON. A layout like that one makes me want to brave the slippery slope and invent fractional frac units! Just drill the frames's mounting holes at .75" increments. Then you could make Dual Dividers. My mistake Tom. 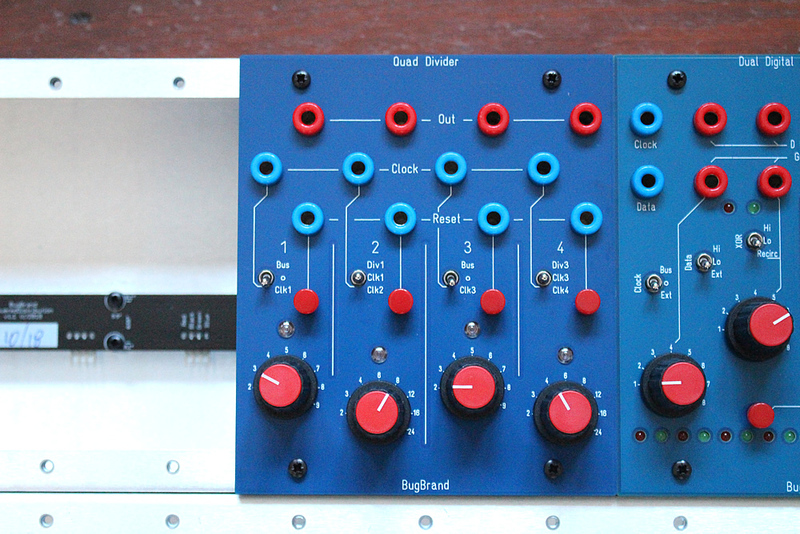 I’m keeping the red and blues separate for now so looking for something to sit in the new frames and although tempted by the new VCO module it’s a bit over kill for driving the divider, DDSR etc. However a 2FW LFO’s sounds ideal. All I ever wanted in a clock modulator and then some. This looks great! It's hard to tell from the pic but can a shorting jack be used diagonally to normal the ouput of a divider into the input of the next divider? There's switches will do 1->2 and 3->4. Also, 4" Pomona banana cords are the flexible alternative to shorting bars. Ah, I don't really keep shorting bars in mind when designing - any positions they do fit is somewhat chance. This module is a beast! Was enjoying in the wider system but last night put it in a little 8fw config for more focused 'getting to know you' sessions - 1 CVCO, 1 QDIV, 1 Dual Filter, 1 Dual mixer with a Korg SQ-1 for control. Finding this divider invites unconventional use, the difference in sound for audio rate divisions between the left and right dividers is really useful, and the multiple options for clock sources on each channel via the inputs and switches means this module can easily become a hub for making a cascade of sonic changes with the flick of a switch. Love it Tom! Received my Divider and it rules! First session last night had some real fun driving the ddsr, clocks from the dual envelopes - pinging the CO filter and cving the Chirper. How many of these made it out into the wild? Will there be another 1fw module to handle the binary divisions like the upcoming Dual Divide? Was looking at the CLK2B recently and thought the staircase outputs were a neat idea! (following a trawl through old blue vids and finding a description by Darenager describing his use of the staircase outs to 'flange' a hihat sound he'd constructed).